Being somewhat of a country boy, from the time I could walk I was being taught how to tell the difference between the 'dangerous' and 'not so dangerous snakes' in the wild. When I was a young child my family lived in a very rural area in Southern Arkansas. We were miles from anything resembling what most people would consider civilization. It was in this middle of nowhere forest home that I began to learn about snakes, and telling them apart at a very young age. Like most children, I had a tendency to explore. Fortunately, my mother kept a close eye on me and I never got to explore the Copperhead infested wilderness surrounding our humble country home. 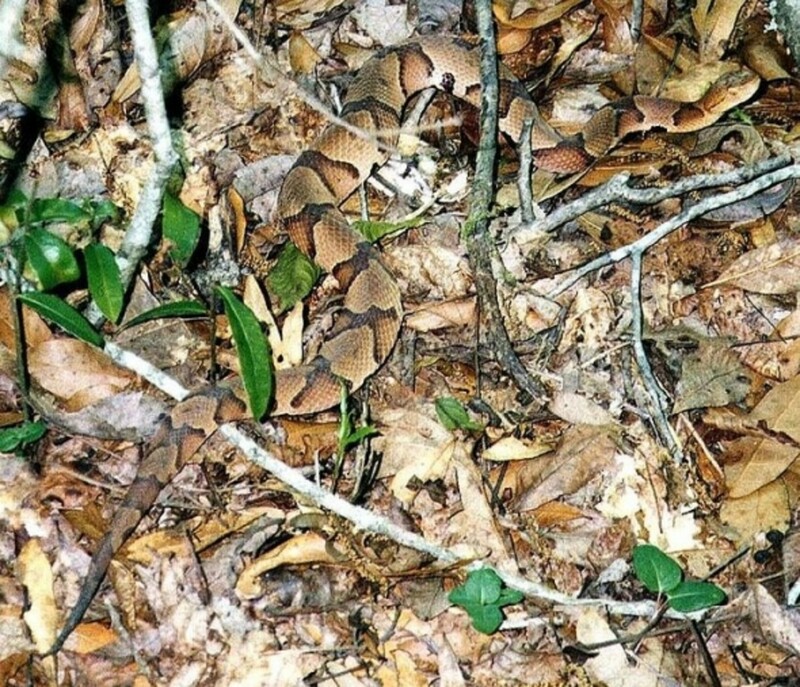 To this day my mother still has pictures of a few of the copperheads found on that property stretching over three feet in length. For those with limited knowledge of the various species of snakes I will discuss Copperheads further down in this article. Suffice to say for now they are one of the four species of venomous snakes in the United States and they are very dangerous. Hearing about my venomous snake infested playground might make some think that playing outside should have been off limit for children in such an area, and I must admit that even as a small child the knowledge that something that dangerous could be close by was quite terrifying even for a young mind. However, there was another kind of snake that I would learn about in those years that make me grow a great appreciation for the species. Even though Copperheads were all around, they were never seen near or around the parameter of the house. Some snakes won't venture near areas of high human traffic, but anyone that has found a snake inside their house knows that this doesn't apply to all of them. Our barn, which only a short distance from the house tended to have a high volume of Copperheads. I wasn't allowed to play anywhere near it. The yard and the parameter of the house were safe though because the big boss of the snake world lived under and around my house. “Sneaky Snake” we had named it, for its tendency to pop out of random places and terrify my mother, was a very large, very beautiful, and very human friendly King snake that lived under and around our house. Oddly enough, this snake was so friendly that it would actually approach us and allow us to handle it. 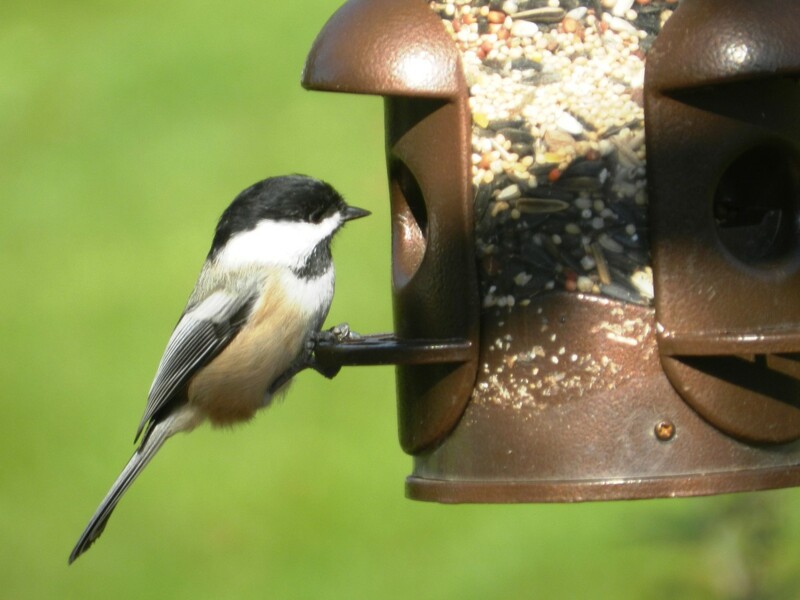 It was always around perched up in a tree or sun bathing on our porch. Locating Sneaky Snake was never much of a challenge. My mother jokingly tells people about how Sneaky Snake was my first babysitter. 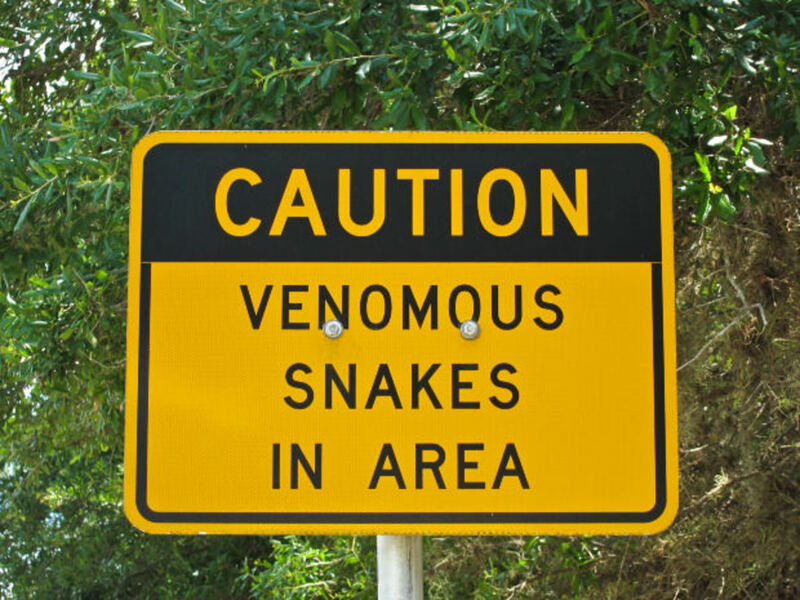 Obviously my mother never left me alone with a giant snake, but her meaning was that as long as Sneaky Snake was around the dangers of venomous snakes was severely cut down. 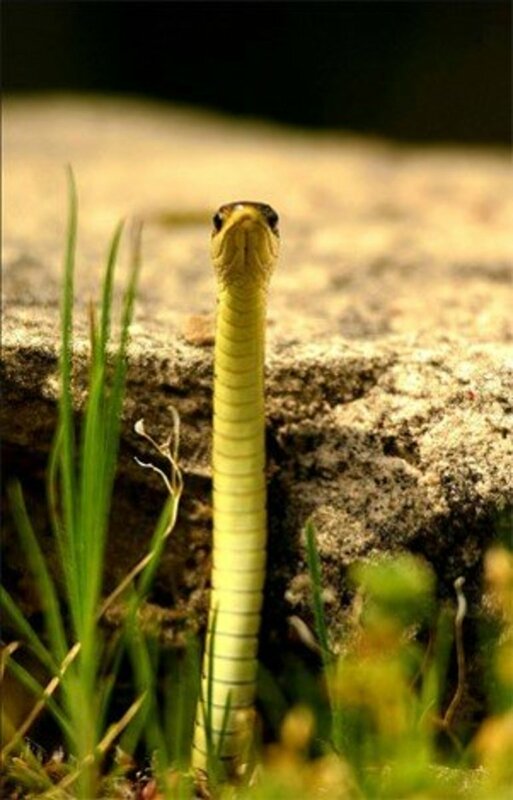 King Snakes are called “King Snakes” because not only do they eat venomous snakes, but they are immune to their venom. If you have ever seen a King Snake interacting with a venomous species of snake, you will see the venomous snake seems to cower in fear before the almighty King Snake. The King snake seems to lack any sense of fear of the other snake whatsoever and will calmly approach its prey, then it will strike it with inhuman speed coiling its body around that of the venomous snake and constricting it to death. The King snake will then consume the dead snake. I am in no way saying that I condone such actions, but if you search on Youtube you can find numerous videos of people feeding wild venomous snakes to their pet King Snakes. The easiest and safest method of handling snakes is not to handle them. If they are out in the wild, and they aren't bothering you, don't bother them! Watch them, appreciate them, and let them slither away from you. Since I know there is a lot of people that won't heed this valuable advice, let me say this... Most people that are bitten by venomous snakes are bit because they trying to handle or kill them. Also note that according to WebMD a dead snake can still bite for approximately 90 minutes after death. I have skinned a few snakes and I can tell you this is true (And a little terrifying). If you choose to ignore my advice about the handling of snakes, at least listen to this... 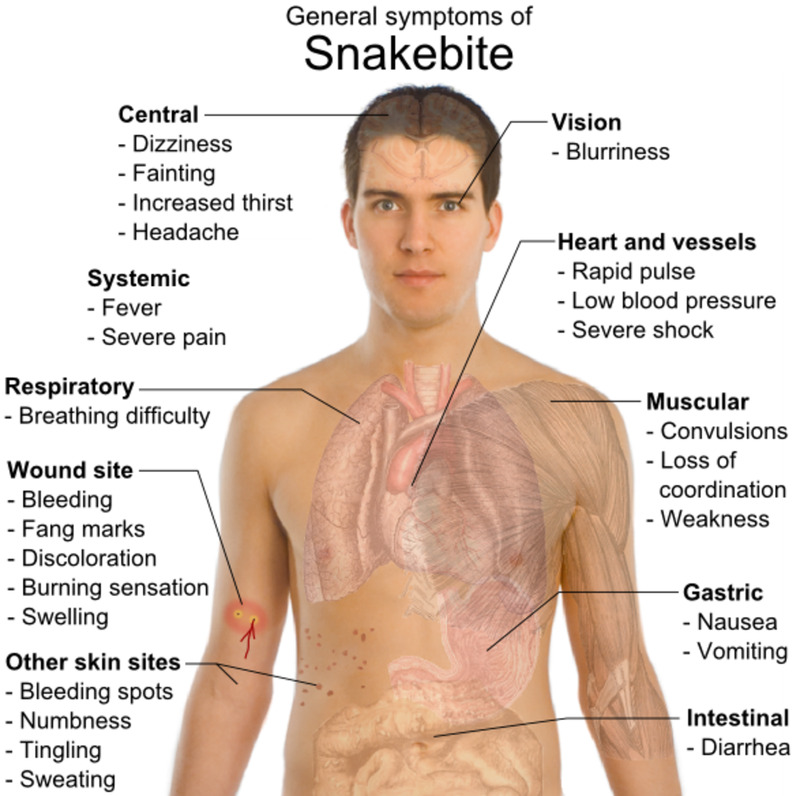 If you get bit by a venomous snake seek medical attention immediately. Hopefully if you get bit you can recognize what kind of snake bit you, because this will make it easier of the medical professionals to find the right anti venom... Which hopefully will save your life and limbs. 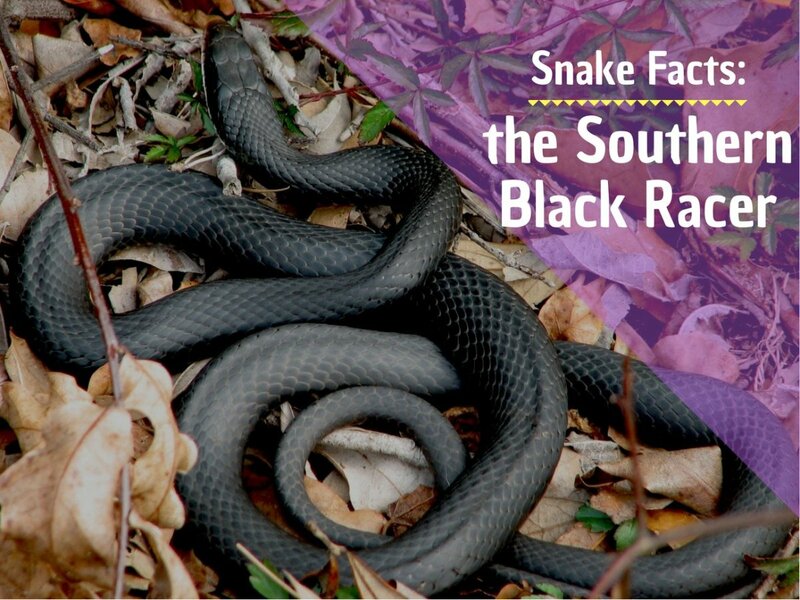 This is a black Rat Snake. Though non-venomous they can pack a mean bite, and they get very big. It is worth mentioning that nonvenomous snake bites are not particularly good either. 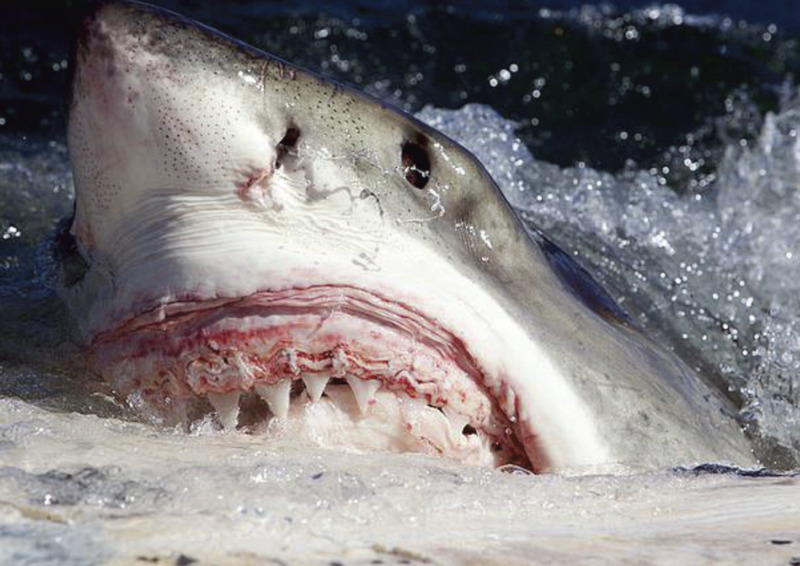 While they are not nearly as dangerous as venomous bites, they can lead to nasty infections and tissue damage. Whenever possible, its generally a good idea to avoid getting bit by snakes. Also snakes carry salmonella as part of their digestive process. Salmonella is a very dangerous disease that can be fatal to humans. So when you ignore my advice about handling snakes be sure to wash your hands. Notice the difference in this black Ratt Snake. 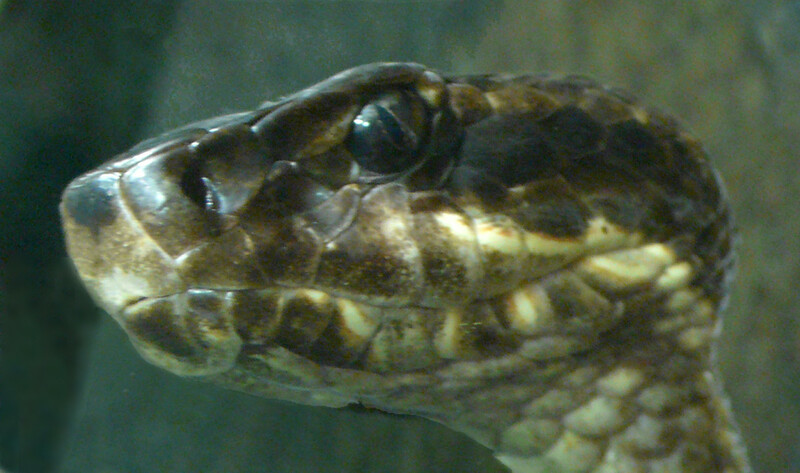 The head is much smaller in comparison, more rounded, and the pupils are round. In the United States three of the four kinds of venomous snakes we have are Pit Vipers. The three species are Copperheads, Water Moccasins, and Rattlesnakes. Being able to spot one of these breads and determine that it is venomous isn't too difficult if you know some basic facts. I often tell people that if you aren't one hundred percent sure it was venomous there is a good chance it wasn't, but you should still use caution. However, if you know the basic rules there is very little room for mistaking any of these three species. 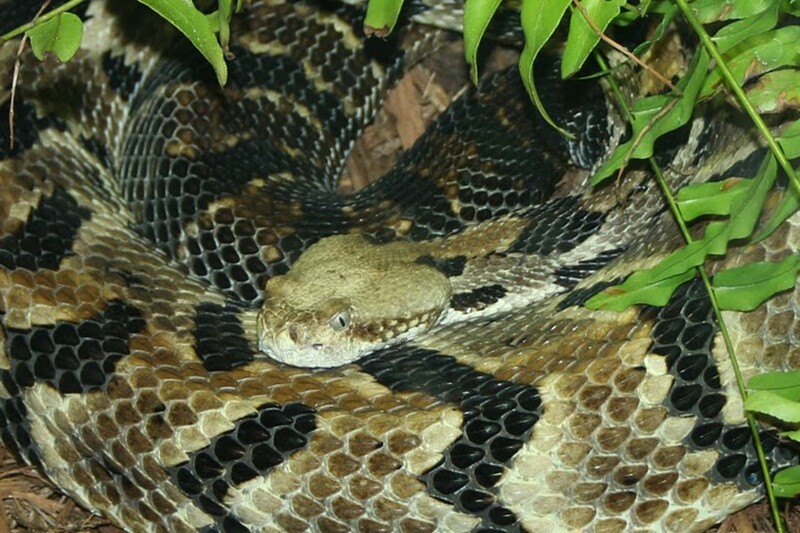 The heads of Pit Vipers are much different from that of the many other breeds of snakes in the United States. Nonvenomous snakes and Coral Snakes have simple long rounded heads. Pit vipers have big diamond shaped heads with a point at the end. The fat bottom part of their head is extra wide because it contains the large venom glands. The also have large pits between there nostrils and eyes. These pits allow the snakes a sense of infrared, and it is the reason behind the name “Pit Viper”. The eyes are completely different as well. Other snakes have round pupils some what similar to humans. Pit Vipers have long slits on there eyes rather than rounded pupils. If you can remember these two main differences you will be more likely to be able to distinguish Pit Vipers from other snakes. Rattlesnakes are one of the most well known snakes in the United States because of the signature rattles on the tip of their tail. The rattles are often used to warn you of their presence, and when the snake feels that it is in danger it will often rattle considerably before striking. People who have spent much time around Rattlesnakes know that distinct sound quite well. 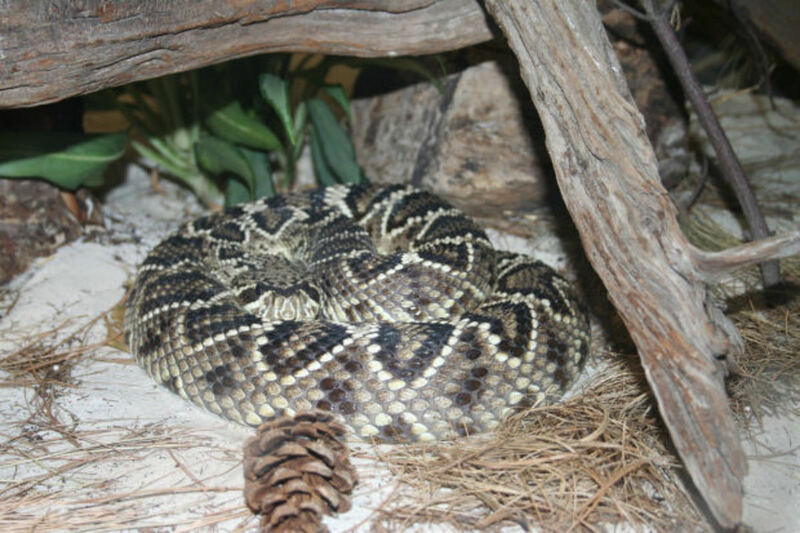 There are several different types of rattlesnakes in the U.S., some of the more popular ones being the Eastern and Western diamond backs, Timber, and Pigmy Rattlesnakes. Though they may come in different sizes, patterns, and colors they can all be easily distinguished by the rattle on their tail. 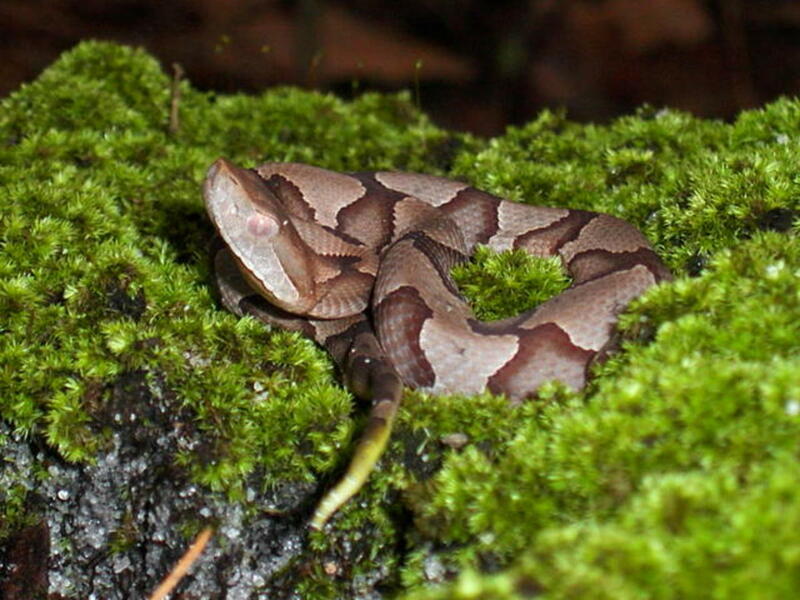 An interesting fact that most people don't know about Copperheads is that they are actually closely related to Water Moccasins in that they are not just also Pit Vipers but dry land Moccasins themselves. In simple terms the only difference between a Water Moccasin and a Copperhead is the way they look and that the Copperhead prefers land over water. While all snakes are very good at keeping themselves hidden, in my opinion, Copperheads are experts at camouflaging. The entire pattern of their body resembles leaves laying on the ground. They are generally tan or pinkish with tan or brown spots running down the length of their bodies. There heads, believe it or not, have a sort of copper color to them. Because they are so good at hiding, it is believed they adapted to hold still when they believe they are in danger rather than fleeing like other snakes. This has led to many accidental snake bites by people stepping on the snake when they do not see them. 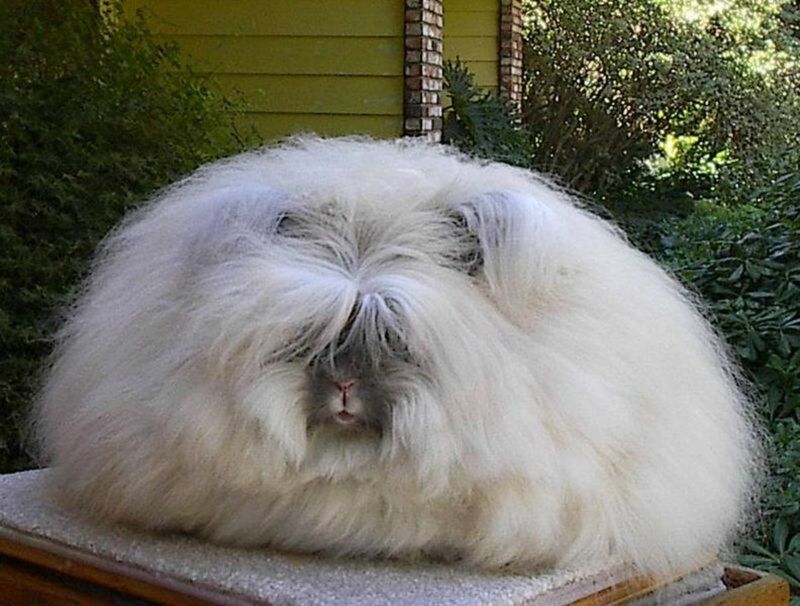 Notice the white mouth? That is why they are commonly referred to as Cottonmouths. Up close they look pretty friendly. Some people, for whatever reason, will argue your ear off all day that Water Moccasins and Cottonmouths are not the same thing. To put it simply, they are wrong. They are the exact same thing. 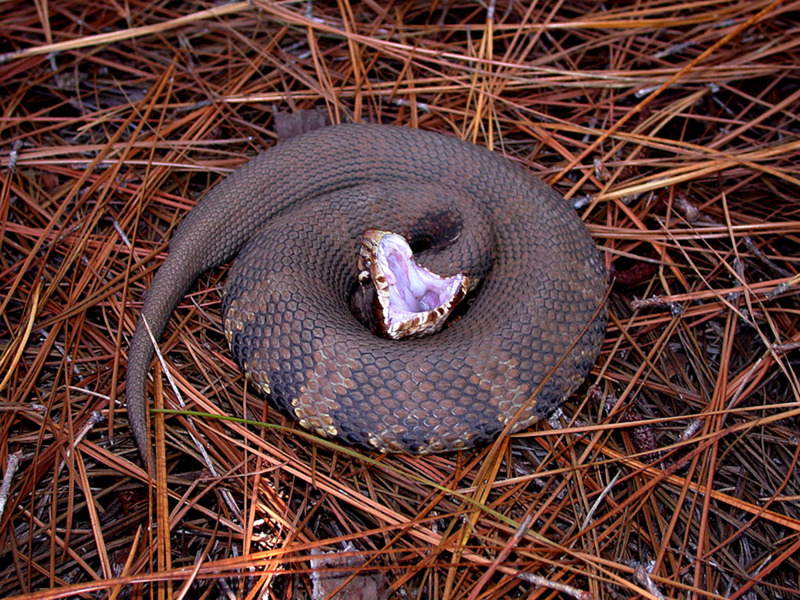 The reason Water Moccasins got the alternative name as Cottonmouth is because the inside of their mouth has a white 'cotton' look. As I mentioned in the section about Copperheads, they are closely related. 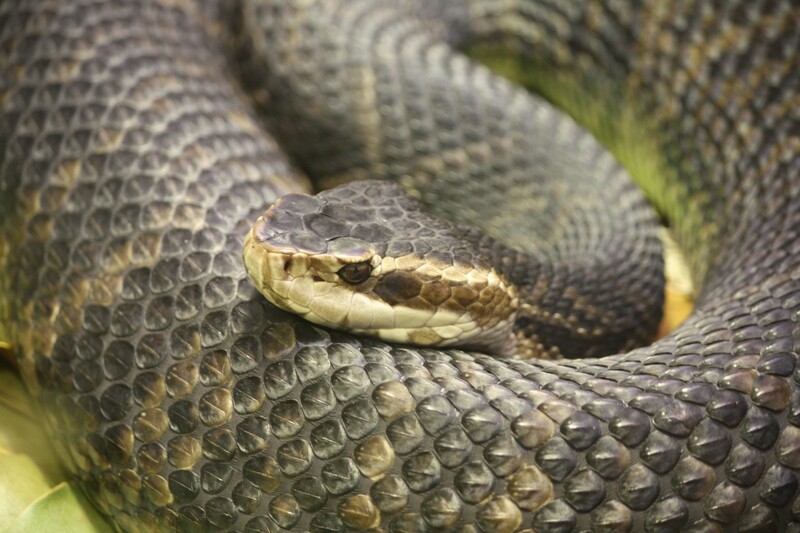 However Water Moccasins live primarily in and around water. This is not to say that you wouldn't see one on land, but chances are that there is a water source very near by. 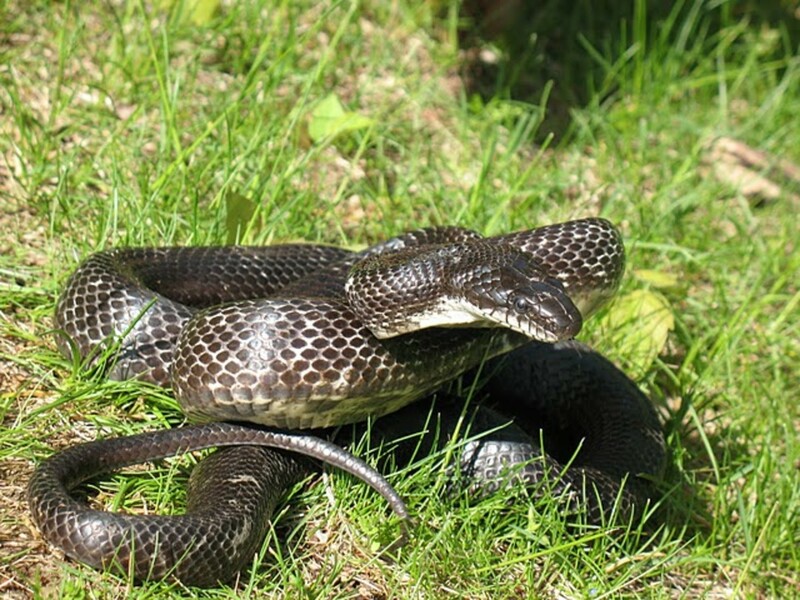 Water Moccasins are generally a very dark brown to black, but can be outside of this with brown, yellow, or gray. 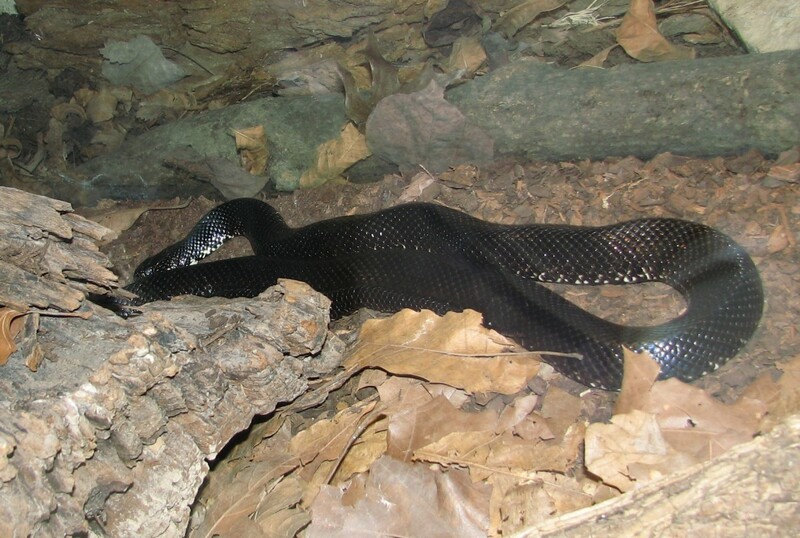 Many common water snakes are killed because they are mistaken as Cottonmouths. 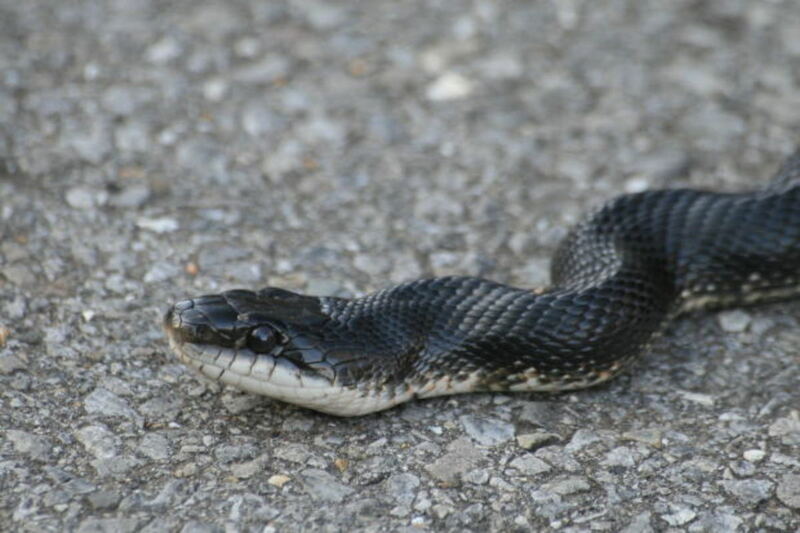 The water snakes head is a little bit wider and can have a similar look. Many people will tell you that they are very aggressive. I personally have seen a very large Cottonmouth raise its head and charge humans. 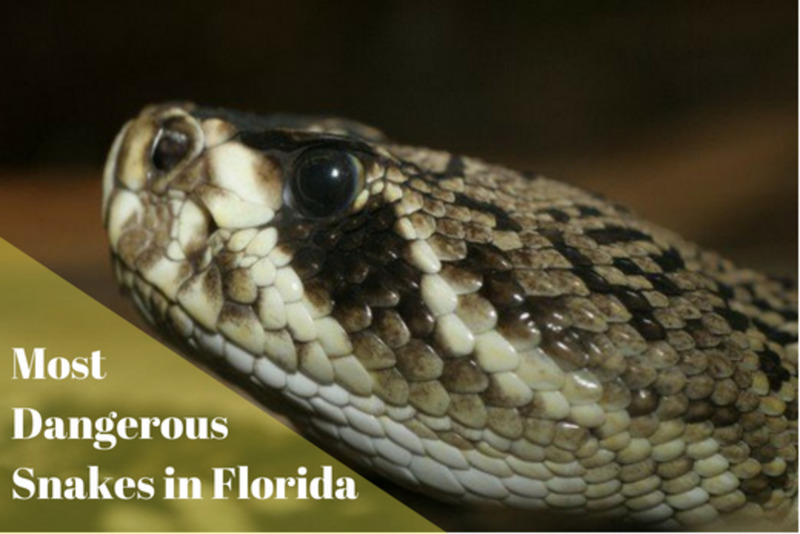 However, as tests have shown more times than not a Water Moccasin will attempt to flee during a human encounter. This isn't a Coral Snake. This is actually a Kingsnake. Notice the colors don't follow the same order. Coral Snakes are not Pit Vipers like the other Venomous snakes of North America. They are what is called an elapid snake, and rather than having large retractable fangs, they have short fixed fangs. 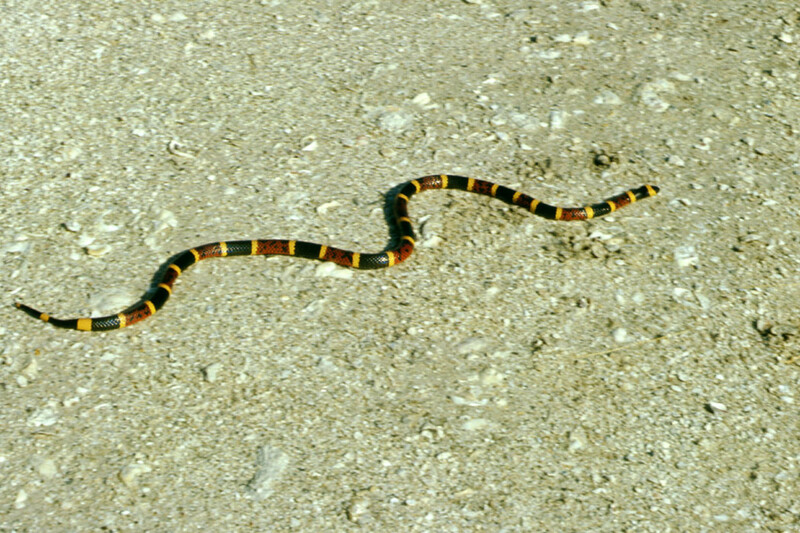 Coral Snakes account for less than one percent of venomous snake bites in the United States. 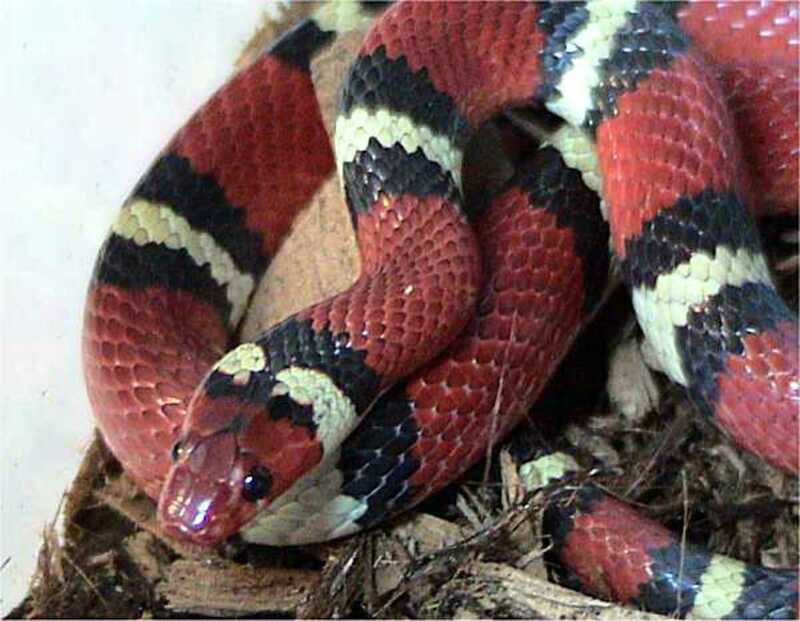 However, this small number of bites does not make them any less dangerous as some variants of the Coral Snake contain some of the most venomous snakes in the United States. 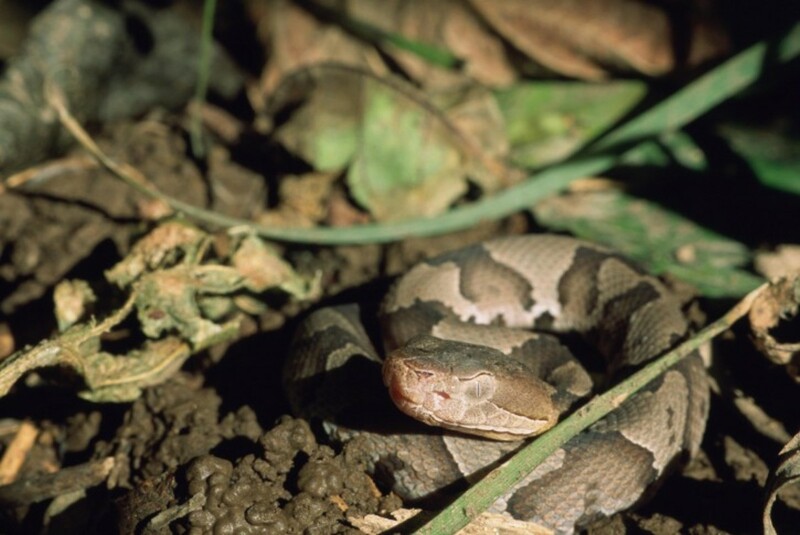 Because the amount of bites are so few, they don't produce as much anti-venom for these snake bites as the do the other snake venoms in United States. Snakes for the most part try to avoid interacting with humans. Yet everyday people encounter these creatures, and unfortunately many people simply seek to destroy every snake in their path. There isn't a single good reason for the mass slaughter for these creatures of nature. Even venomous snakes have their place in the world along with every other living thing. 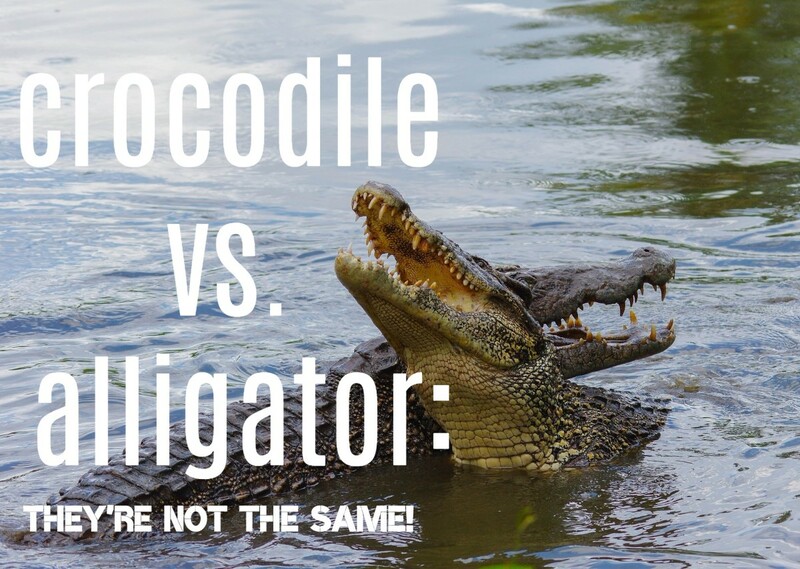 If you can learn to tell them apart, and avoid contact with venomous snakes there is no reason that you can't enjoy nature without a huge fear of this amazing creatures. As you venture out in to the natural world always watch where you walk, and leave the snake handling to the professionals! It is very useful and haha on some of your comments! I saw a small snake in my back yard at the beginning of summer and have not been in my back yard since. Needless to say, I am terrified of snakes; however, knowing that there are very few venomous snakes in Georgia helps to ease my fear a little. I might even go back into my back yard; especially since I just had a pool put in right before I saw the snake. I really need to start enjoying my pool before the summer if over. Thanks for your hub - we don't have snakes in New Zealand, but visit places that do. Very informative hub, and I will check back pre-next snake habitate country visit! I did accidently sit on one in Malaysia - it had curled up under the seat cover in a wee resturant, directly under the air conditioning unit!...lucky I felt it move before I completely sat down - scared the life out of me - Malaysia have vipers! Apparently it wasn't a venemous one...still scary! Conquered my fear the next day holding on to a python! I loved your article I love snakes and really hate when people kill them. You have great advice about venemous snakes non venemous snakes. Thanks for the comment bydojo! Those things sound nasty! Thanks annitakison! 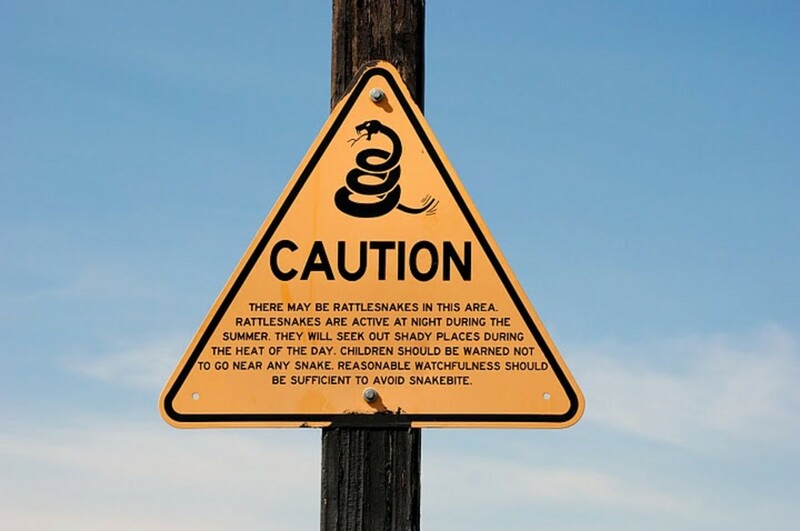 I appreciate it, and yes rattlesnakes can be very dangerous. Haha Mel! You won't catch me stepping over a rattlesnake, but yes I completely agree with you, and thank you for the comment! I love your hub. Growing up in Arizona I came across my share of rattlesnakes, and I also learned to respect and appreciate them. I soon found out that if you don't mess with snakes they greatly prefer to run away than have a confrontation. People are overly paranoid about snakes. There is a false assumption that snakes deliberately seek out humans to bite them, and this is unfortunate, because they are expert rodent killers! When I used to hike in the desert in the early morning hours, rattlesnakes would often be out sunning themselves on the trails to warm up their sluggish cold blood. When they were in this state you could literally step across them without them even moving. Of course, now that I am older and perhaps wiser and I doubt I would try this! hiii Phillbert , you write a very interest article on snakes. I really feel Scared from snakes specially Rattle snakes. 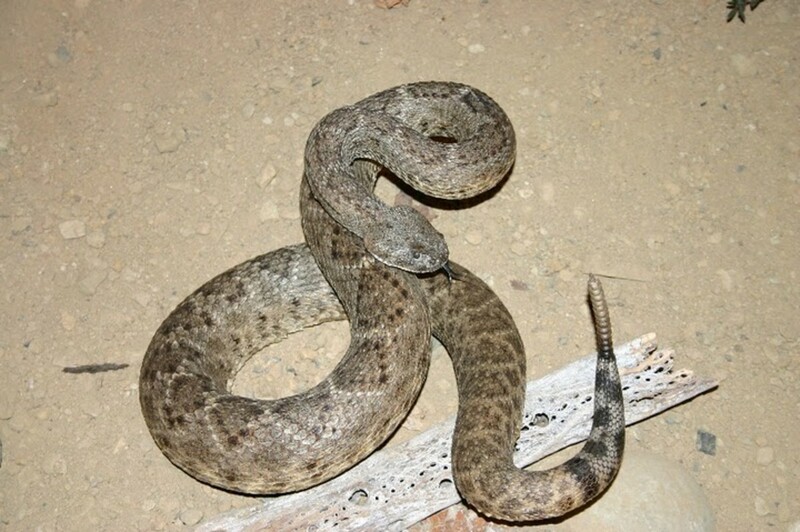 Rattlesnakes produce a sound and its quite dangerous. Really useful though. I'm terrified at the snakes, so my first reaction would be to run from ANY snake I see. 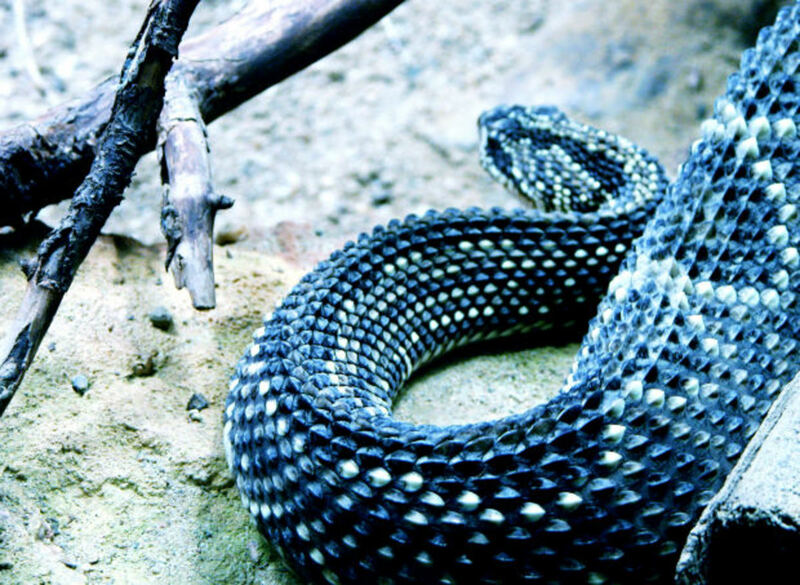 Knowing which are the most dangerous and which are just annoying (if they bite you) is indeed useful, should I take a walk in some of these places in the US, when you can find the snakes. Wow Hannah! That's pretty much the coolest thing to hear ever! I'm glad it proved useful to you ! Thanks for letting me know! Great analysis of the human body due to a bit. That was informative. Great Hub. Thank you Multiman! I appreciate it! Im glad you enjoyed the article! I am rom South Carolina, so snakes are not real fun for me, but yur information was a good read and informative, I voted up!